Home > Azerbaijan > Dangerous Work: Increasing Pressure on Environmental NGOs and Activists in the Countries of the Former Soviet Union and the U.S. Dangerous Work: Increasing Pressure on Environmental NGOs and Activists in the Countries of the Former Soviet Union and the U.S.
Crude Accountability, together with Ecoforum of NGOs Kazakhstan, present a report Dangerous Work: Increasing Pressure on Environmental NGOs and Activists in the Countries of the Former Soviet Union and the U.S. The report is devoted to environmentalists who have been or continue to be persecuted in the countries of the former Soviet Union and in the U.S. for their work to protect everyone’s right to a healthy environment. We have gathered various examples of harassment, punishment, physical violence, and even murder of environmentalists in the countries of the former Soviet Union and the United States. 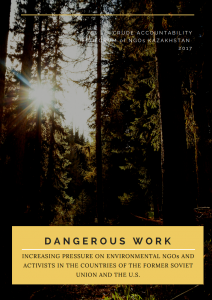 With detailed examples cases from Armenia, Azerbaijan, Belarus, Georgia, Kazakhstan, Kyrgyzstan, Turkmenistan, Ukraine, Russia, and the U.S., our report identifies an alarming trend of violence and intimidation targeting environmentalists, despite provisions of the international human rights law designed to protect them. We urge governments and international organizations immediately to declare unacceptable all acts of repression against environmental defenders and to take steps to protect their rights. States are under an obligation to promote and safeguard the right to protect the environment and to advocate for sustainable development in harmony with nature. States are also under an obligation to ensure respect for environmental defenders’ other rights often violated by governments, private companies, mass media, and other actors. Without the right to live in a healthy environment, a wide range of other human rights and freedoms cannot be fully realized. Ensuring a normal, safe, and decent atmosphere for environmental defenders is an essential component of all States and other actors’ obligation to protect the environment. In essence, humanity’s sustainable development and well-being rely on respect and recognition of environmental defenders and their efforts.